Editor’s Note: For all those martial artists who are not judo practitioners, but who understand the importance of cross training, this is an important technique. If you ever find yourself on the ground with a grappler, even if you don’t apply this technique yourself, you should understand the how, where and when of this technique, as others might try to exercise this armlock on you. 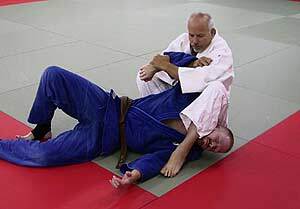 Thus, understanding the cross armlock is a basic form of self-defense. 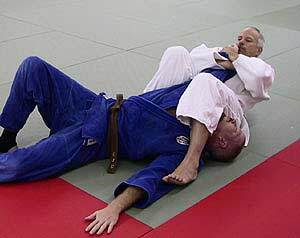 The Kodokan Judo technique Ude Hishigi Juji Gatame is commonly called jujigatame, or cross armlock. It gets its name from the position of the person doing the technique (tori) across the opponent's body. 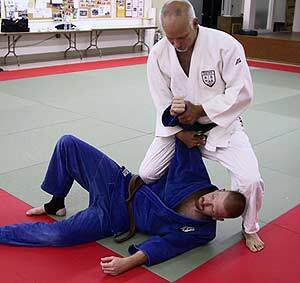 It is one of the most effective armlocks in judo, and it is consistently the number one winning armlock used in international judo competition. It is equally effective when used for self-defense, and the technique is included in many modern and traditional jujutsu systems. It is particularly powerful because tori uses the entire body, including the strength of the legs and hips, to control the person receiving the technique (uke) and to apply tremendous pressure to the straightened arm. For this reason it can be done against much larger or stronger opponents without difficulty. For the same reason it is also potentially dangerous and should only be practiced with proper safety precautions and instruction. There are many variations of jujigatame done from different positions and angles, and numerous entries to the armlock from various opportunities. These include variations done from the back when uke is approaching from between the legs, turnovers from the hands and knees position, and the flying jujigatame done from the standing position. The basic version shown below was included in the kata of Kodokan Judo grappling techniques (katame-no-kata) by the founder of judo, Jigoro Kano. It is shown below by Neil Ohlenkamp, rokudan, on Jerrod Wilson, sankyu. 1. Beginning in the most common position gained after completing a successful throw (sweep, or a strike in karate, taekwondo or kung fu), tori drops his right knee onto uke to begin controlling him and to prevent him from turning towards tori. The left knee can also be used for this purpose on the head. Both hands control uke's arm with one forearm placed on uke's elbow. 2. Tori begins to get better control of uke's arm by squatting, and pulling uke's elbow tightly onto tori's stomach or chest. Tori also places his left foot over uke's head so that uke will not be able to sit up. 3. Tori sits down very close to uke's shoulder so that uke's arm is still controlled by tori's body. Uke's elbow must be on tori's abdomen in the final position, so sitting close under the elbow is essential. Tori pulls uke's elbow strongly with his right forearm. 4. Tori begins to lean back keeping constant pressure on uke's arm and squeezing the knees together to control the shoulder. 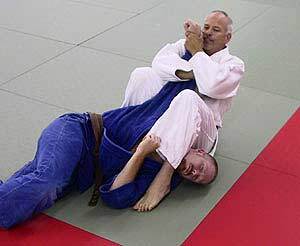 Using the legs, tori should be able to keep uke down even without applying the joint-lock pressure. At this point tori makes sure that uke's thumb is pointing up so that the pressure will be applied towards the little finger side of the arm. 6. Tori's hand position can vary from the standard position with both hands grabbing uke's wrist. In this version tori has his arms crossed with the forearms controlling uke's wrist. This is useful when uke is fighting the arm extension and tori needs to use the power of his body to pull. 8. A strong variation is to cross the right foot over the left and to pull in with the feet. This will help to control uke's left arm, and to prevent uke from pushing tori's left leg off his head in an escape attempt. There are many opportunities for applying this armbar while grappling, but the key is always to control the opponent's body, and particularly the elbow, throughout the application of jujigatame. Copyright © 2004 by Neil Ohlenkamp, JudoInfo.com, USA & FightingArts.com. Neil Ohlenkamp is a martial arts teacher and founder of the internationally acclaimed judo website: www.judoinfo.com. He holds a seventh degree black belt in Judo and a sixth degree black belt in jujitsu and has over 31 years of training and experience in various martial arts as a competitor, instructor, team coach, and tournament official. He is a certified United States Judo Association instructor, referee, master rank examiner, and master coach (the highest level of certification), and he was awarded United States Judo Coach of the Year for 1999. Ohlenkamp is an advisor to FightingArts.com and has been a regular contributor of articles on judo and related topics.